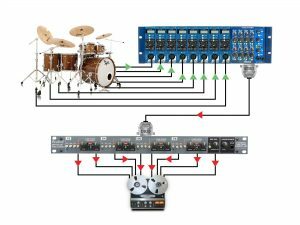 The Space Heater is an 8-channel tube overdrive that can be used as an analog summing mixer or as a multi-channel studio effects device, utilizing the tube circuitry for a range of effects from subtle warmth and grit to full harmonic distortion. The Space Heater is a high performance summing mixer that allows you to blend tracks out-of-the-box in the analog domain, with oversized output transformers and vacuum tubes for vintage warmth and character. 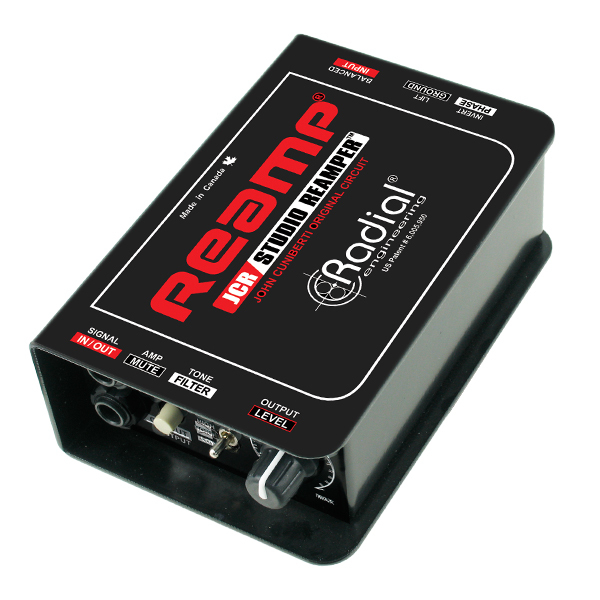 Eight mono input channels or four stereo pairs are available, with a heat switch on each pair to adjust the voltage on the 12AX7 tube - lower voltage settings starve the tube for a more pronounced distortion effect. 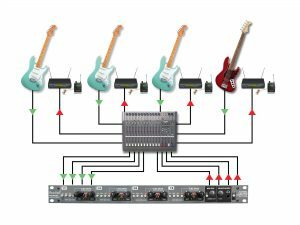 Separate Drive and Level controls on each channel give you complete control over each tube circuit, providing a range of tones that allow you to fatten up digital stems or provide a distorted effect on vocals, guitars or drums. 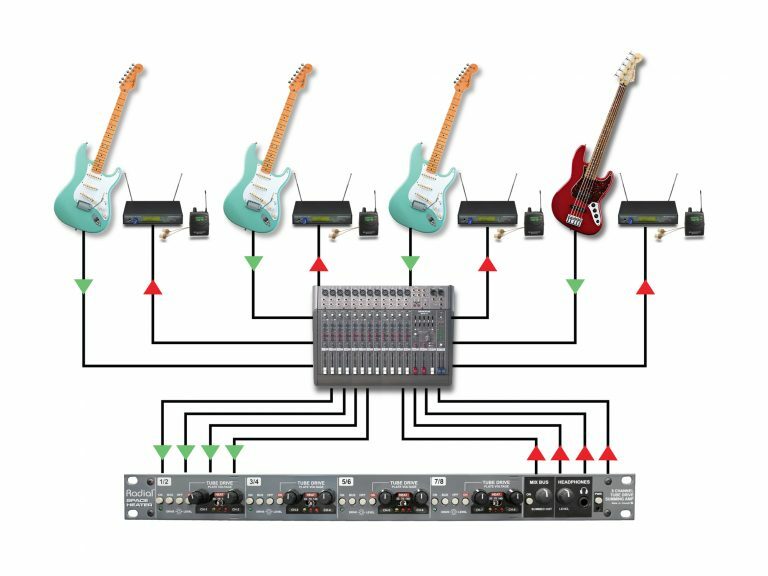 Use the Space Heater™ on eight individual tracks in your mix to add grit or character. Adjustable LEVEL and DRIVE tailors the level of distortion from subtle to extreme. Complete your final summing out-of-the-box by sending stereo stem mixes to the Space Heater. Mix four stereo stems down to a master stereo output, or link multiple Space Heaters together for analog summing heaven! Get the natural feel and tone back into your in-ear monitors by adding the natural compression of tube distortion into the signal path. 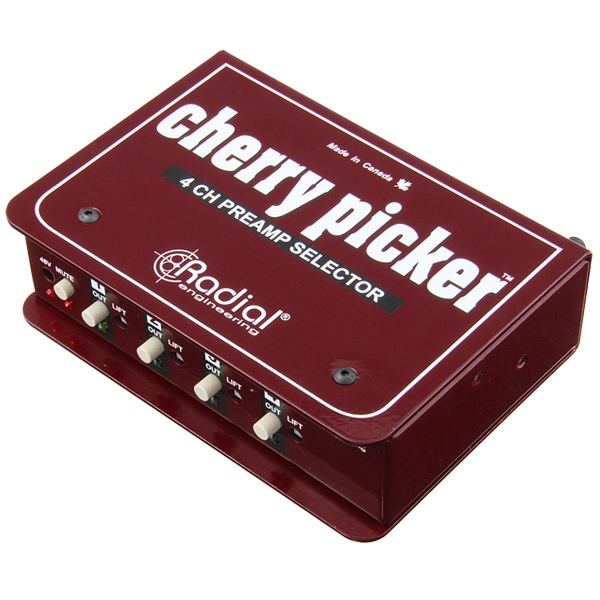 It's like playing in front of your amp without the stage noise! Set the Space Heater to 25 volts to create humungous tube crunch and adjust the drive and level to suit. 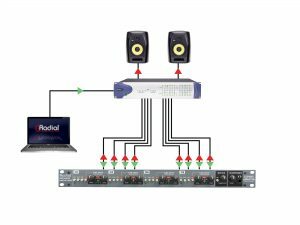 Use the individual sends as outputs to feed your recorder or mix down to stereo using the built-in bus..
"Aside from buying a large format-console, it is hard to imagine any single piece of gear that could have a more profound influence on all of your recordings and mixes than the Space Heater. If you need to get out of a rut, or take your tracks to the next level, this is a surefire way to breathe new life into your work." 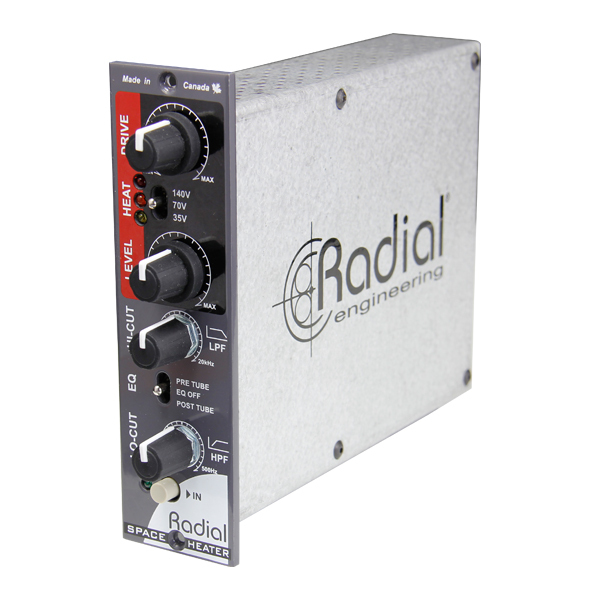 "Applications for the Space Heater abound; Radial suggests using it for a range of things, from the last stage of a vocal recording chain to desterilizing in-ear monitor mixes, all of which are personally tantalizing after having heard its capabilities in both studio and live settings... Notably, the unit is always crystal clean when you need clarity, or as dirty as you want it when you need grit." "The multichannel Space Heater is a very cost-effective way to obtain eight channels of real tube and transformer distortion — for both track and stem processing. 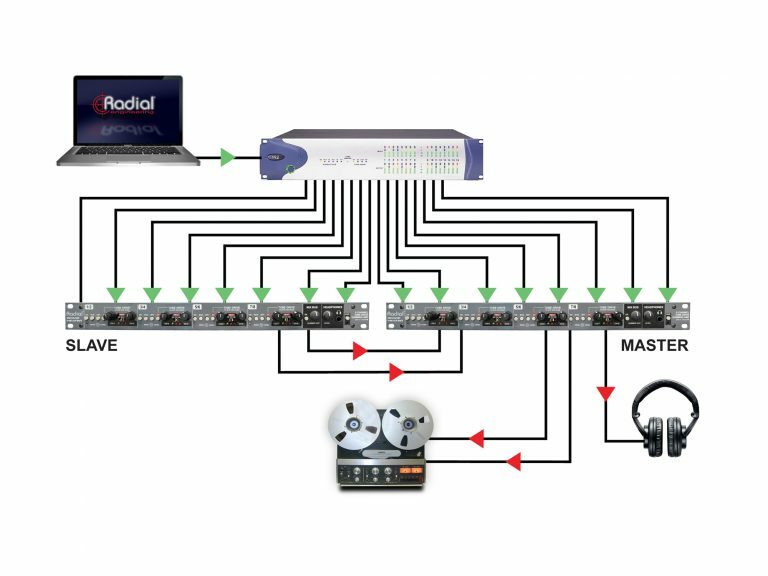 Plus, like all of Radial Engineering's products, [it has] great secondary features — sweepable filters on the module, summing bus and headphone output on the rackmount — that add real value, truly making it a multi-use box." 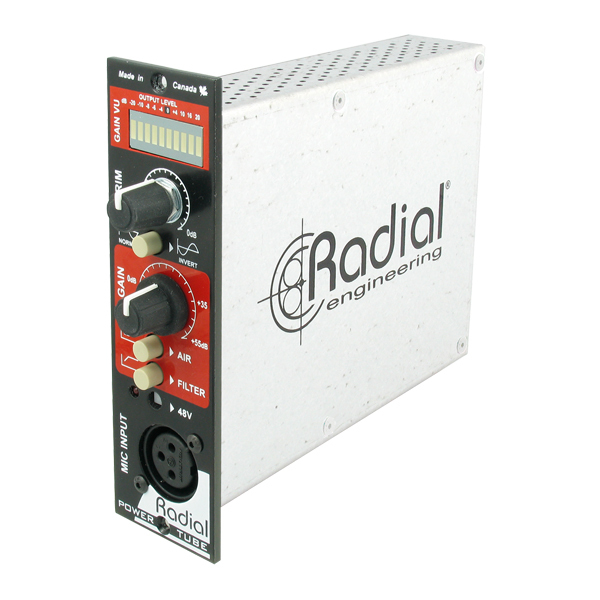 "The Space Heater not only excels as an expandable, eight-channel summing mixer that can add grit and a real vintage tube-console vibe to a final stereo mix, but also gives you the individual outputs that turn it into an eight-channel harmonic distortion effects unit that's more than useful at adding character and grit when you're tracking or creating stems."